When you closes your eyes and thinks about hip-hop, it’s safe to assume you are not envisioning David Letterman. While the man himself may not embody our favorite genre, Letterman’s staple "Late Show" on CBS, which airs its final broadcast Wednesday night, has served as a platform for creating career-defining moments for rappers spanning generations. Since its inception in 1993, the "Late Show" has kept the doors of the famed Ed Sullivan Theater open for young stars to establish themselves and establish stars to sustain their light or reinvigorate themselves. 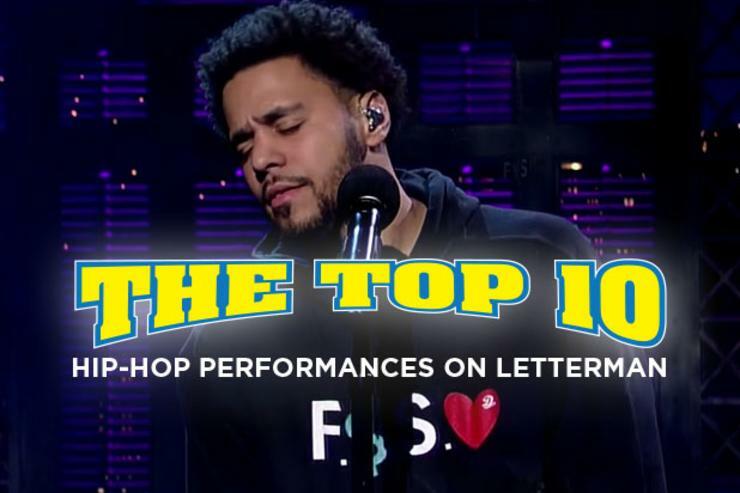 So, without further ado: join us as we take a look at the best hip-hop performances the "Late Show" has ever seen in the only way that our beloved gap-toothed late night talk show host would have it: a Top 10 list. Not only does Le1f’s performance in his home-town of Manhattan entertain at a high level with dancers and live instrumentation, but it is also a triumph in television in hip-hop. With Le1f’s late night debut in March of 2014, he became the first openly gay hip-hop recording artist to perform on television. 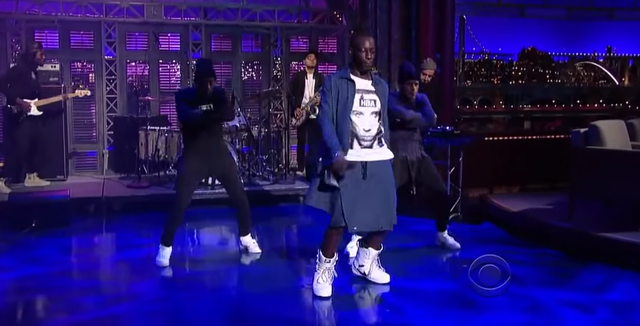 Performing "Wut," the rapper/producer joins in on choreography and never misses a beat or loses his flow - all while wearing a denim skirt and Nike moonboots that Letterman himself envies. 9. Gorillaz & De La Soul - Feel Good, Inc. 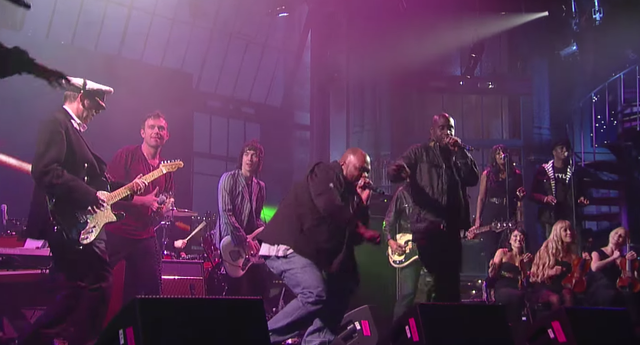 In a rare fully-revealing live appearance by the Gorillaz, that was part of a full concert in tandem with Letterman’s broadcast, a performance of their smash success single "Feel Good Inc." was made even more delightful and unique by De La Soul’s accompaniment. Since appearances by both groups are few and far between - this definitely feels like a television moment to remember. 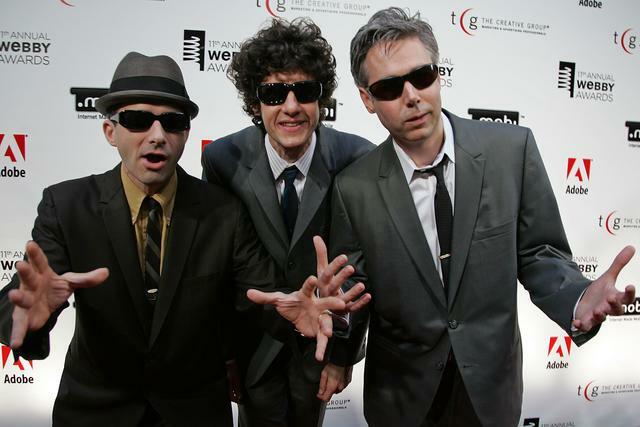 After a six year absence, the Beastie Boys came back with a bang with their 2004 album To the 5 Boroughs. Staying true to the albums’ title, the legendary rap group performed ‘Ch-Check it Out’ - one of the group's last bonafide hits - as they emerged from the New York City train station in their trademark Flying-V formation and made their way down Broadway towards the Ed Sullivan Theater. The performance ends with the trio in studio and hilariously taunting Dave in the dark. 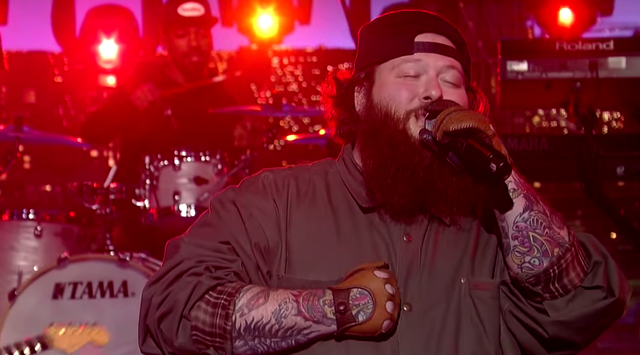 The charismatic Action Bronson performed the single off of his 2015 release Mr. Wonderful just one borough to the left of his hometown of Queens, New York. Bronson brought the funk (and Chance the Rapper), performing a rocking rendition of ‘Baby Blue’ with a live backing band. The performance is extra worthy because - whether they knew it or not - Bronson and Chance were the last rappers to have a performance on Letterman’s "Late Show." Old school Kanye is really something to behold. In his first late night talk show appearance, the man who grew to become Yeezus pulls out all the stops. 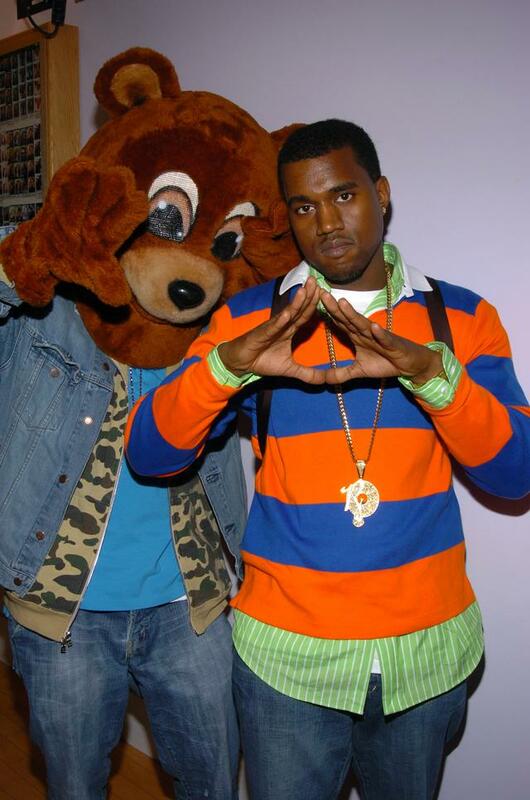 Not only did he bring along Syleena Johnson to sing the beautiful - now legendary - hook of "All Falls Down" and live instrumentation including an electric violin, he also brought his trademark College Dropout bear mascot to dance in the background. I wonder how much that person got paid to boogie in that. 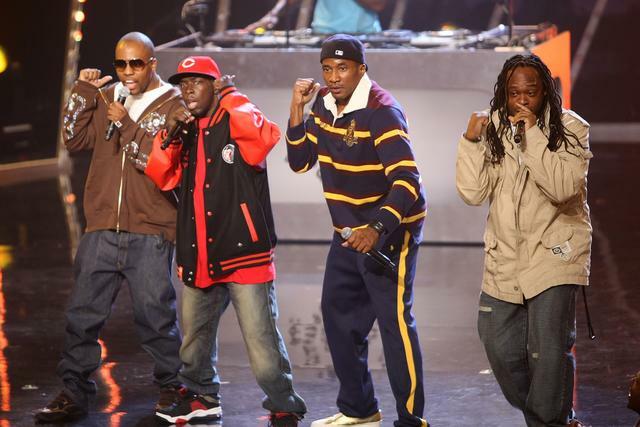 The Roots have been household names to every hip-hop fan for decades. They truly transcended the genre when they became the house band for Jimmy Fallon’s "Late Night" show in 2009 (the show that Letterman originally made famous as host). In a cool moment of late night irony, the Philly group performed their adrenaline fueled track "Here I Come" for Letterman’s "Late Show." 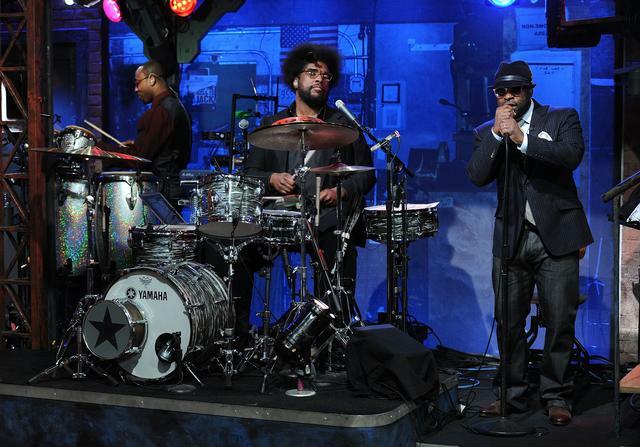 Three years later, the Roots crew would use the song as the theme song for Jimmy Fallon’s "Late Night" show. J. Cole’s heralded album 2014 Forest Hills Drive was an intimate look into the rapper’s struggles and psyche. 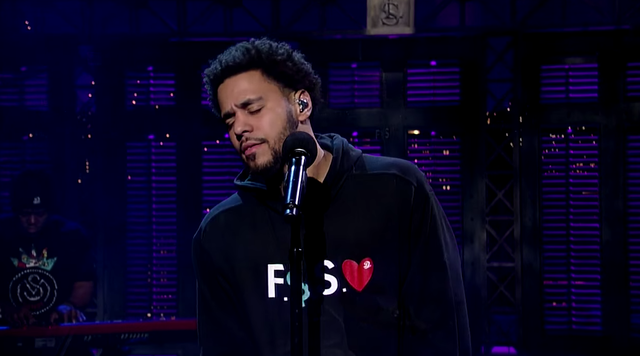 On the heels of its release in December 2014, Cole took to the Letterman stage to engage in a minimalist performance of "Be Free." J. Cole’s brow is furrowed with angst as he punches his way through heavy lyrics allusive to the turmoil in the fallout of the Ferguson and other tragedies of that nature. It’s extremely heartfelt, authentic, and is certainly haunting enough that it ranks on this list. The ragtag bunch of Brooklynites made their fortune by rocking out with raps. 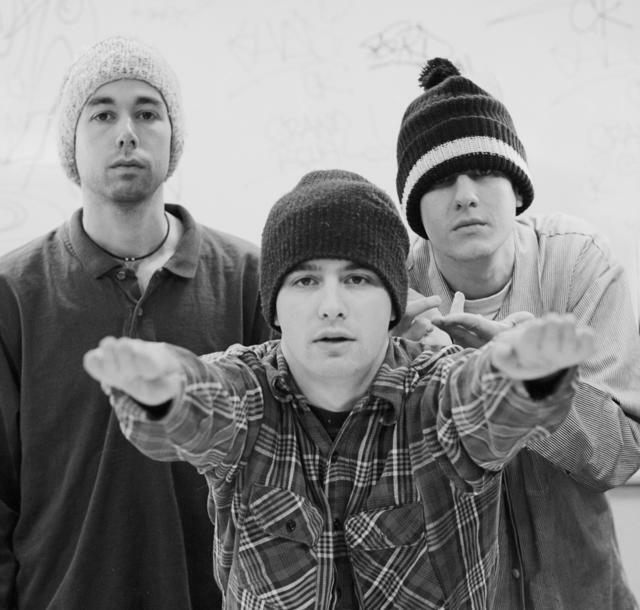 However, in this 1994 performance of "Sabotage" on the "Late Show" Adam Yauch, Mike D, and Ad-Rock plug in and perform with instruments. It’s a super-cool way to witness one of their all-time best tracks, which features two live drum kits. In the winter of 1996, these three hip-hop forces combined to warm the Ed Sullivan theater up by dropping some straight fire. The performance is worthwhile based on the merit of these two disbanded groups collaborating on the hollowed televised grounds of the "Late Show." The combined energies of Tribe, Busta, and Fugees still pop off the screen despite its predating HD quality. In 2001, rising stars Eminem and Jay-Z merged to create the scathing rebuttal to critics known and remembered as "Renegade" off of The Blueprint. 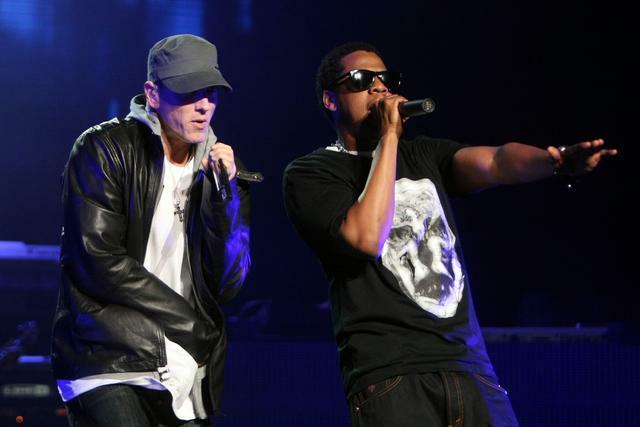 Nearly a decade after that track’s release, Em and Hova merged once again to perform a double bill at their respective hometowns of Detroit and New York City. To promote the event, the two rappers - now living legends - performed their original collaboration on a NYC rooftop on Letterman’s flagship talk show. All those fans, Letterman included, huddled around the intimate sky-level stage is quite the sight to behold.